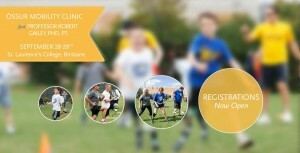 Proudly partnering with Limbs 4 Life, Össur presents a 2-day Mobility Clinic designed for amputees / persons with limbs difference of all ages and activity levels for a truly unique experience to improve overall mobility while connecting with other amputees. Professor Robert Gailey PhD, renowned expert in amputee running and training, will teach amputee attendees how to walk and run like a champion or simply improve multi-directional mobility. The Clinic will be delivered on the 28th and 29th of September in Brisbane.